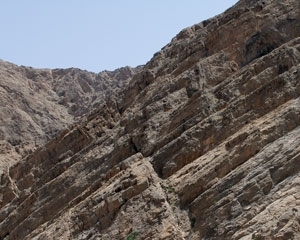 By applying pressure on a rock, two things can happen: either it is soft and releases the pressure by folding or it is hard and therefore only able to fault whereby the rock unit cracks with the two sides sliding against each other. Sometimes faults are so tiny they can only be seen with a microscope, others are on a scale of kilometres. 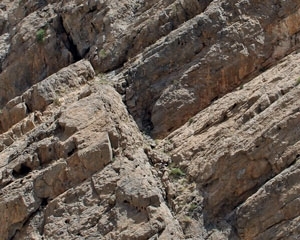 The fault in the limestone here runs upward and away from the wadi bed at a 45-degree angle.